Hillside, IL – This past week Doobert volunteers transported Brandie, a rescue dog, from Tulsa, Oklahoma to Hillside, Illinois. 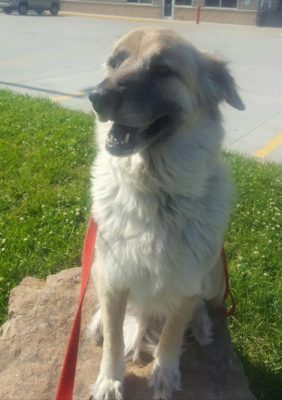 Brandie w as found as a stray in Sand Springs, Oklahoma. She looked as if she had been on her own for awhile before a local couple found her on the streets. Unfortunately they could not keep her very long. Brandie was posted on several Facebook pages and groups to find her owner. The owners could not be found and no one claimed her. She was brought into a boarding facility where she was kept safe until a local rescue was called for her. They found someone to foster Brandie in Illinois and thanks to Doobert organization RACE4Ran, she was transported over 700 miles from Tulsa, Oklahoma to Hillside, Illinois. Brandie is now looking for her forever home.